South Africa's Springbok Casino is celebrating Wine Month through August with a special collection of articles and videos exploring the countries famour wine regions -- and a free spins offer for slots players. The library of South African wine articles and videos is available at https://www.springbokcasino.co.za/wines. Free spins on the Lucha Libre slot from Realtime Gaming are available until August 31st. One of the top ten producers in the world, South Africa produces about 4% of the world’s wine, mostly near the coast in the Western Cape. To earn the important Wine of Origin (WO) designation, wines must contain grapes from only one of the 27 diverse districts. 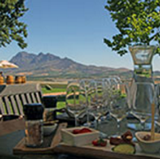 Established in 1679, Stellenbosch is South Africa’s Napa Valley. The second oldest settlement in South Africa it has a winemaking tradition of more than 300 years. Free spins on Lucha Libre slot available until August 31, 2017. With more than 250 years of winemaking knowledge and close to 20,000 cultivated hectares, the Worcester winelands, an hour’s drive from Cape Town, account for almost a third of the country’s wine and spirits production. Worcester Wine Route forms part of Cape Route 62, the longest wine route in the world. Paarl is another one of the most famous wine-producing areas in South Africa, named after the way rounded granite outcrops on top of Pearl Mountain glisten after the rain. Red, white and rosé Paarl’s wine are well recognised among wine connoisseurs around the world. The Cape’s most northerly wine-growing region stretches along the Orange River providing an extensive range of dessert wines, semi-sweet wines and blends, though reds are also being increasingly planted. Springbok’s videos (https://www.springbokcasino.co.za/wines) also showcase wineries in The Klein Karoo where and harsh conditions are ideal for the production of excellent wines which are largely grown organically. Springbok entertains South African online casino players with hundreds of games from Realtime Gaming. They’re all played in Rands and customer service is available in both English and Afrikaans. Next week, the casino will introduce Gemtopia, a dazzling new jewel-encrusted game from RTG with expanding wilds, free spins and progressive jackpots.